When I first began gardening years ago, one of the first plants I purchased was a rose bush and I put it out in front of the first home I ever bought because I remembered growing up that my mother's rose bushes always loved the morning sun they got at the front of the house. I thought myself lucky that my own house faced the same direction and I was excited at the prospect of growing roses around my big picture window. What I didn't seem to recall from all those years in my childhood home, was how much work my mother spent pruning and taking care of her rose bushes to get them to look so spectacular. Isn't that always the case with children? I learned very quickly that growing roses was much different than growing other types of plants and that I had to learn to respect them and care for them if I wanted them to give me a stunning summer display. I started off my rose gardening adventures with two climbing varieties in fact, the ever popular Iceberg and the Golden Showers roses. I bought them the way most new growers do, through a local garden center where they were already grown in 2 gallon pots. So my first crack at roses was not very elaborate. I wish I knew then what I know now. I didn't learn until several seasons later that you were supposed to train your climbers, and/or prune them to manageable heights if you so desired. I just let mine grow however they wanted. When it finally came time to prune them after a couple seasons, because they were overgrowing the front of my house and literally growing into the cracks of the siding, I finally saw the light! Thorns hurt! Especially when you are dealing with older branches that are thick and rigid and have gotten accustomed to growing of their own accord. Even to this day I have to wrestle with those two rose bushes because the location I gave them was poorly planned with nearby plants. I have often wished I had done a little more research and bought myself thornless climbing roses instead. As I looked around I discovered that there are not many true thornless climbing roses, but there are a few out there. There are also a number of them that most growers will call "nearly thornless" or "virtually thornless". The Zephrine Drouhin is one such thornless rose with its pink blooms with whitish accents. It has a great old style fragrance and is very easy to train because of the flexibility of its branches. One unique feature about this rose is it will continue to bloom all throughout the summer if you deadhead it. This is a little unusual with the older roses. The Cecile Brunner Antique rose is another climber that has little or no thorns to worry about and have been around since the late 1800's. The blooms on these thornless roses start off as a light pink and gradually fade to an almost white color. 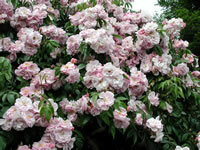 The Cecile Brunner is disease resistant and it can still do well with a little shade and soil that isn't perfect. The Lady Banks climbing rose happens to be one of my personal favorites because I really like yellow roses, especially ones that don't have thorns! At full maturity this gem can get as big as 20 feet tall, so make sure you plan accordingly. These thornless roses are very resistant to diseases and it produces clusters of small yellow blooms about 2 inches in diameter. 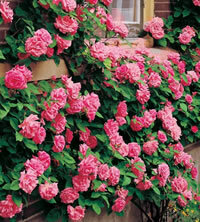 All of these thornless climbing roses would make a great addition to any landscaping idea! How you plant your thornless roses depends in part on how you purchased them. If you ordered them online, then you probably received them as bareroot plants. This means they are in their dormant state. We have a great article on Planting Bare Root Roses in the main category so check that out for detailed information. You will start off by digging your hole wide enough to fit the roots and deep enough so that you can mound up some soil in the center and still keep the bud union about an inch or two below the surface of the soil. If your roses came from the local nursery in containers, then I like to dig my hole about twice the diameter of the container, and equally as deep. Caring for your thornless roses is rather simple, first, make sure that you don't overwater your plants. This might seem like a no brainer but so many gardeners make this mistake. In general, you want to give your roses one deep watering each week, or every 4-5 days if you live in an unusually hot climate. 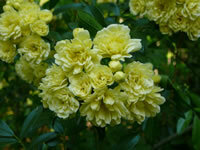 You also can feed your thornless roses with a good all-purpose granular fertilizer. I personally stay away from the liquid chemical ones as I have found they burn certain roses too easily if not applied precisely. You can feed your roses in early spring when the leaves begin to form. If you are growing a variety of thornless roses that are repeat bloomers, you can feed them again just as the first big bloom begins to develop, and once more around mid-July to help promote additional flushes. Just be sure to allow at least 4 weeks in between blooms. Pruning your thornless roses is simple as well and only takes a few minutes. Start off by removing any dead or diseased looking canes. Then remove any lateral canes that have overlapped one another as these will eventually compete for sun light. Lastly, shape and/or train your thornless roses to go the direction you want them to, by either tying off the canes to the support, or pruning back to a bud facing the direction you would like it to grow. The rest is just general shaping of the plant to your satisfaction!